CarFest, for Children in Need, is the inspired creation of BBC’s Chris Evans. It’s a truly family orientated festival that combined his love of cars and live music. This mix has made it the ‘must have ticket’ for petrol heads and music fans alike. 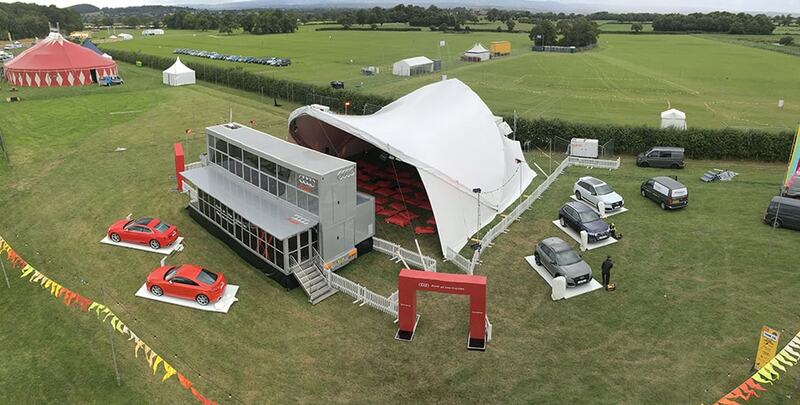 Pb were commissioned by Audi UK to provide support for their - Audi at the Movies - activation at CarFest North, July 2017 at the Bolesworth Hall Estate. The open field site had to be turned into an exclusive, comfortable and relaxed environment for Audi guests to watch a carefully selected range of blockbuster films. The guest journey on the site allowed for a check in process in the Audi MEU. Branded archways then led the guests through to a sheltered seating area. Large bean bags and blankets provided families the chance to recline and watch films that included, Beauty and the Beast and Finding Dory on a 5m wide LED screen. Audi cars were displayed on white plinths outside the seating area. The sheer size of the main structure, festoon lighting and branded flags really give great presence to the activation and it truly embraced the festival feel that Audi wished to create. Both the pre-event planning and production onsite called for a wide team from Pb’s in-house resource and the onsite crew really enjoyed playing their part in what was a really fun weekend. Audi were delighted with the feedback they received for their activation both on site and post event and the organisers of CarFest North were extremely positive about of the look and feel of the space created by the Pb team.